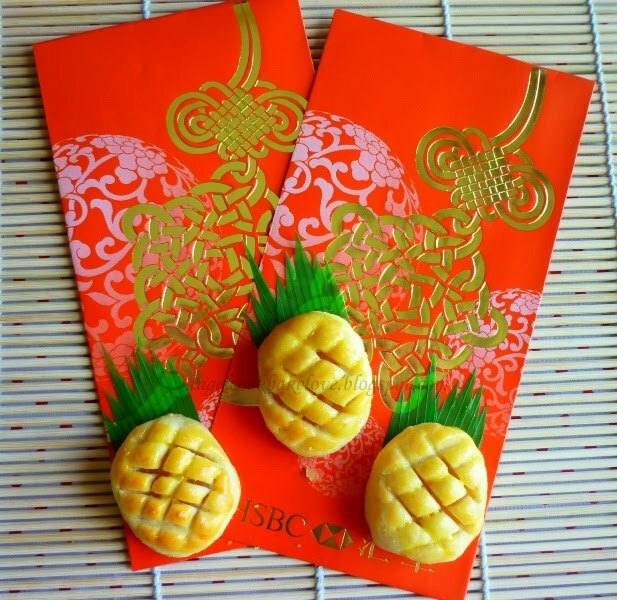 Pineapple tart is my favourite CNY bake, I will never get tired of trying different type of pineapple tarts whenever I have chance. The type of pastry I like is soft and buttery (must have very strong butter taste) and not too crumbly (I don’t want it to crack in my hand). For the paste, I prefer slight sour than sweet. I know homemade one is the best but I still use ready-made one for the convenience sake (read here to see how I modify the store-bought pineapple jam). When I made my first pineapple tart in year 2009 I treated it like a small project. I tried different recipes (sometimes just made small changes to see the difference, e.g. with and without cornflour/ with and without baking powder). I even tried adding dairy cream to the dough. The problem with this recipe is that the dough is super difficult to handle due to its high butter ratio. So this year I revisit the recipe and add little custard powder, the little starch makes the dough much easier to handle. Custard powder is actually cornflour with added colour and flavouring. So if it is not available, it can be replaced by cornflour. So how’s the taste and texture? I would say it’s almost there, very close to “the one”. I can’t describe how “the one” taste like; it’s the standard I set to myself to achieve. I will be making another batch so I asked D if I should try another recipe or make any changes to this, his answer was no. He said I should stick to this recipe, as the result was fabulous. Should I? 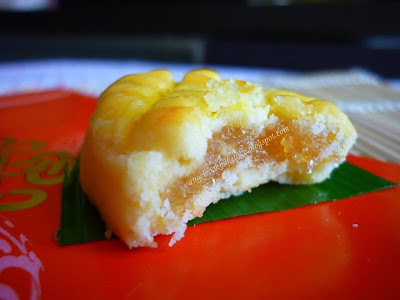 Do give this recipe a try if you have the same liking of pineapple tart as me. 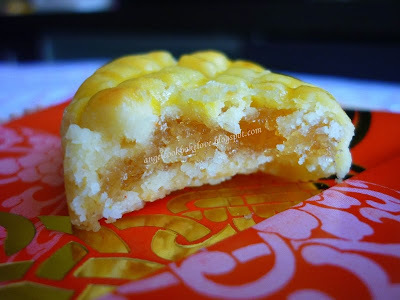 I am submitting this to Aspiring Bakers # 3: My Favorite CNY Cookie (Jan 2011) hosted by j3ss kitch3n. *Roll into ball of slightly below ½ tbsp each, about 8g. Feel free to make it smaller (e.g. 1 tsp each). 1) Sift flour, custard powder and icing sugar together into a mixing bowl. 2) Add in butter, use fingertips to rub the butter into the flour until you see no trace of butter and flour. 3) Lightly beat egg yolk and vanilla essence, add into the butter/flour mixture, combine and press lightly to form a dough (do not knead). 4) Wrap the dough with cling wrap and refrigerate for about an hour to firm it up before shaping (you may skip this if you think the dough is not too soft to handle). 5) To assemble, roll the dough into ball (each dough is slight rounded ½ tbsp), make a hole at the centre by thumb, place the pineapple paste ball into the hole, wrap and roll again. If want to make into pineapple shape, slightly flatten the ball and use fork to make crisscross pattern on top. 5) Line baking tray with greaseproof paper, place pineapple tart on top. 6) Bake in preheat oven at 190C for 6 mins, middle rack, remove tarts from oven, apply egg wash (that’s how you get shinning and yellow glazing, no colouring added). 7) Return to oven to bake at 180C for another 4 -5 mins. 8) Use a flat spatula to transfer the tarts to wire rack for cooling. Allow tarts to cool completely before storing in an airtight container. 1) You may use your preferred brand of butter but remember use only real butter, not “spread” or margarine. 2) Adjust the oven temperature and baking time according to your oven condition and tart size. Mmmm...my favourite cookies. Wish I can have some now! the glaze looks very nice...... mine is not as golden as yours, even when it's not diluted with water. 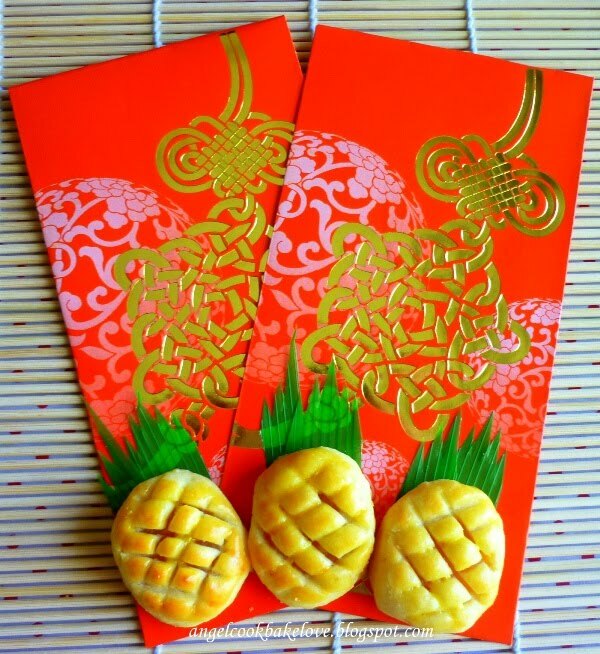 I also prefer those which are soft and buttery, but this year I think I won't be baking pineapple tarts, not enough time la! Hi my friends, thank you for your lovely comments. Wendy, the trick to get the golden glaze is to apply the egg wash only after baking for a few mins until the shell is cooked/harden. I added about 1/2 to 1 tsp of water to egg yolk. If I don't dilute it I find it hard to spread nicely. This is one very nice pineapple tart. I like your glaze - a lot of time must have gone into doing this. The glazing part actually didn't take up much time. I think I spend more time shaping. Happy rabbit year to you! So cute! I love the pineapple design. How long the home made pineapple can last? I used storre bought pineapple paste, kept in airtight container at room temp, 1 - 2 months no problem. Please take note that if using home-made pineapple paste it must be cooked till dry and the storage time may be shorter. I never thought I would have the courage to make this! Love your tarts design. Please tell me what went wrong. I tried your recipe. I cut the butter into the flour well, then add beaten egg york all at once. Wrap it & Freeze for half hour. Waited few mins then flatten the dough but it stick and then broke up in my hand. I floured my desk but it still break on me. The pineapple keeps coming out whenI roll it. After wrapping I didn't freeze it. I directly shape it and placed on the baking tray. I guess your tart was too dry and hard after freezing that's why it broke when you tried to flatten it. Btw, could you please leave your name in your comment next time? Hi Angel, I am your new fans here. I've just tried your melt in mouth german cookies and it taste really awesome and I am so happy and excited. 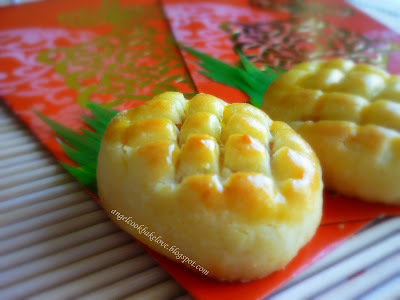 I love this pineapple tarts too, I am gonna try to make it this weekend. Could you tell me how to you do the crisscross in such a nice cut/line on it? So thin and can even see some of the pineapple jam inside.. So cute!! But I dont think I can use it with fork? Or else it'll become like german cookies' shape right? I used the side of the fork to press down and make crisscross pattern. If you want the line to be deep (so that can see little bit of the pineappele paste) just press hardly.